from wherever you are so you’ll always get the best experience. Not all Wi-Fi bands are the same, but you don’t need to worry about that. With Smart Connect Technology, the ULTRA Wi-Fi Router chooses from the three Wi-Fi bands and automatically connects each device to the best and less congested band for optimal wireless experience. 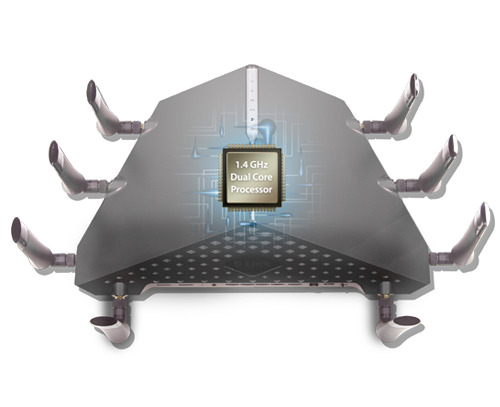 A 1.4 GHz dual core processor gives you all the processing power you need to support more devices and apps in your home. Experience the ultimate lag-free gaming experience, 4K media streaming and fast data transfer. Throw DIR-895L the challenge of supporting all variety of devices and maintaining the highest standard of entertainment or gaming streaming, and watch it perform its magic beyond what a normal router can do with its iQoS and ample bandwidth. Fear no more about the insecurity you face when you access your home network outside your home. With QuickVPN feature in DIR-895L, you can enjoy secured internet access by your home network while having a cup of coffee watching the snowflakes dancing past the window! The DIR-895L is designed to support MU-MIMO (Multi-User Multiple Input Multiple Output) technology that allows multiple devices to get high-bandwidth Wi-Fi signal at the same time. You can stream HD media faster and play lag-free gaming. Compared to SU-MIMO (Single-User Multiple Input Multiple Output) technology, MU-MIMO distributes data more efficiently, giving you the fastest Wi-Fi speeds in your home. To ensure that you get the best online experience via incredible network speed and coverage, DIR-895L provides the bandwidth and range for all your devices, from PCs to mobile devices and supports the different operating system such as Windows®1, Mac OS®2 and Linux®3 and Android. Ensuring fuss free setup and surfing. 1. Windows is either registered trademarks or trademarks of Microsoft Corporation in the United States and/or other countries.​ 2. Mac OS® is a trademark of Apple Inc. 3. Linux® is the registered trademark of Linus Torvalds in the U.S. and other countries. 4. The actual performance may vary as a result of network conditions and environmental factors. 5. The actual performance may vary as a result of the number and specification of devices connected. 6. MU-MIMO firmware feature will be available by the Q1 2016 7. MU-MIMO-certified client(s) required. This is a solid performing router for those with extreme internet service and with the latest compatible hardware in their devices. Great for gamers and those who want to stream 4K video. This tri-band router is useful for homes with numerous Wi-Fi devices. But its performance is middling, and the typical home user will probably just use a fraction of its features. Without a doubt, the D-Link AC5300 Ultra WiFi Router DIR-895L/R is also one of the most stylish and futuristic looking routers currently in the market. We feel this router is a niche market as new units are currently priced at $369.99. The casual gamer/streamer probably won’t utilize most of the functions to its potential and would probably be just as happy with the D-Link AC3200 DIR-895L/R Ultra WiFi Router. It is the fastest router we have tested to date. The $359.99 price tag on Amazon is hefty for this big, red spider-beast but trust us, it is worth every single penny. As more devices are being used throughout the home that require high bandwidth, not just Internet of Things devices, but also streaming HD video and online gaming, users will need a network that can keep up with demand. Systems like the Unified Home Wi-Fi Network Kit will use adaptive technology — connected devices will automatically hop between the router and extenders based on the connection that is providing the best performance at any given moment on any given device. If you’re looking for a powerful router to accompany your modem than you really should check out the AC5300 MU-MIMO Ultra Wi-Fi Router DIR-895L from D-link which provides some exceptional WiFi range and throughput. Setup is easy, the interface is simple yet powerful and all in all, this allowed us to connect a plethora of WiFi devices, included wired devices to this router with no issues whatsoever. The unit is large but fortunately can be wall mounted. If you want to make a statement with your router, this shiny red beast is certainly one to consider if you wallet can afford it. However, there needs to be an honourable mention for the older, D-Link AC3200 DIR-890L router. This is essentially the same as the (tested) D-Link AC5300 DIR-895L router but for one less 5GHz network and no MU-MIMO potential. It offers the same features, proved itself capable at all ranges and costs just $350! 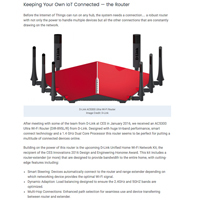 The main difference between the 2 routers is the technology enhancements. The DIR-895L runs at AC5300 while the DIR-890L blazes at AC3200. What this means is that the DIR-895L can achieve up to 5300 Mbps, using 3 Wi-Fi bands – 2.4GHz at 1000Mbps and 2x 5GHz at 2165Mbps. In comparison, the DIR-890L delivers 2.4GHz at 600Mbps and 2x 5GHz at 1300Mbps, adding to 3200Mbps. When we tested D-Link's AC3200 Ultra Wi-Fi Router (DIR-890L/R)$249.99 at Dell last year, its speedy throughput scores, intuitive management settings, and edgy design earned the router our Editors' Choice nod. Any feature required by someone interested in security or control over specific frequencies has been accounted for and represented in this router’s software suite. Enjoy parental controls, IPv6 support, and close monitoring of traffic with SmartConnect and SmartStream. The box it comes in is pretty big, and illustrates that this isn’t something you’ll hide with ease. The box contains a CD with related software, a quick installation guide, D-Link Cloud apps leaflet & Warranty information, as well as a phone cable, 1.5m long CAT-5 cable and both UK & US plugs. It also has some wall mounting screws, if that’s your thing. I was honestly surprised by the size of the router itself, as it’s easily twice the size of any router I’ve ever owned, at 4.5 x 25 x 22 cm. It also has eight aerials, something I’ve never had, though I suppose you only have to attach as many as you like. Obviously, the more you attach, the wider and more stable your Wi-Fi connection will be. On the front of the unit are the usual indicator lights for power and connection status. The rear of it has a USB 2.0, USB 3.0, power and four ethernet connections. There is also a slot for the internet connection from a fibre router, and buttons for power, WPS and reset. The final thing is a switch which allows you to switch between Router and Extender mode. I would conservatively estimate that over 50% of the unit is made up of vents, which I wouldn’t outright say is a negative thing. Unfortunately, due to having internet issues unrelated to the router, I wasn’t able to test this for an extreme length of time to see what kind of heat it generated if left on for weeks at a time. Once all of the wires were hooked up, setting up the router is painless, done through your browser. It’s all made clear in the quick start instructions, so you shouldn’t have an issue if you don’t have a DVD drive for the included CD. 1000Mbps is the theoretical speed that the AC5300 can deliver over the 2.4Ghz band – of course it is depending on the wireless card that you have in your device. The upside of this high connectivity is that the data stream is constant and consistent even at high transfer loads. Plus, the router supports Multiple In Multiple Out (MIMO), and the eight antenna helps (it is not just for show!). You get not two, but three Wifi Band – 2.4GHz and two 5GHz bands for better data transfer with high-performance devices. Of course, there is also the ports at the back when you need wired connections. You get four Gigabit ethernet ports, a USB 2.0 and USB 3.0 port and a physical switch that allows the AC5300 to work as a router or a range extender.